Londonderry's Bishop's Gate Hotel has been crowned the winner of AA Hotel of the Year - Northern Ireland. 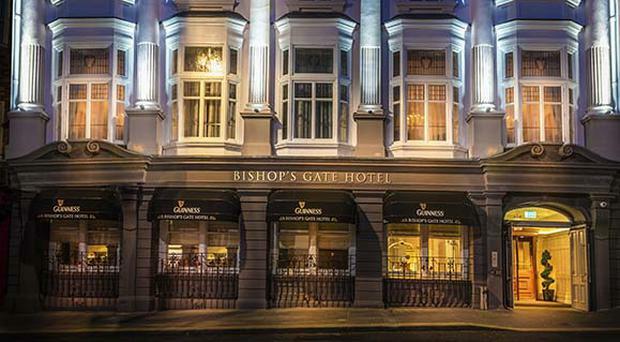 Bishop's Gate Hotel is located within the historic city walls in the heart of the Cathedral Quarter, Derry. It was built in 1899 for members of the local gentry who had fought in the Crimean War, and was known as the Northern Counties Club. The Grade B1 listed building has a rich history and has welcomed visits from many illustrious people, from Churchill to WB Yeats, and from Field Marshal Montgomery to artist, Derek Hill. This boutique hotel has undergone a restoration programme that fully showcases the fine Victorian architecture; the results display high degrees of luxury and quality as can be seen in the residents’ lounge, restaurant and champagne and cocktail bar. The AA noted that "it is the warmth of the hospitality from all the team that really sets this hotel apart from the rest".